English skills are essential to attainment in school and opportunities throughout life. We teach English skills through a carefully selected range of high quality children’s literature using the Power of Reading – a scheme which enhances teachers’ and children’s pleasure in reading, and raises children’s achievement through teachers’ knowledge of literature and its creative use in the classroom. Using a range of picture books and chapter books as stimulus, we teach lessons which develop the children’s speaking, listening, reading and writing. Children engage with high quality picture books, poetry, novels and non-fiction through a wide range of teaching approaches. There is immersion into the text through music, art, drama, discussion and role-play. Other approaches include responding to illustrations, ‘Book Talk’, story mapping and book making. Reading is a vital skill for all children to learn. It allows them to access information needed in all areas of the curriculum at school, helping them to achieve in all subjects. Reading is also a lifelong skill which the children will use in their everyday lives, opening up the doorway to learning and exploring the world in which we live. It increases confidence and is enjoyable. 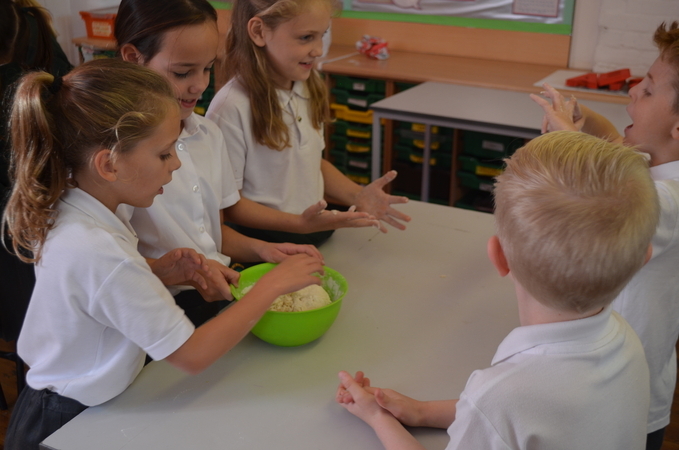 At Mereworth Community Primary School we believe that helping children to make progress in their reading is most successful when done in partnership between home and school. How do we teach children to read? Children read texts which are at a suitable level for their ability. They should be challenged in their reading but the book should not be too difficult. Each book is carefully selected from the range of books in our scheme. 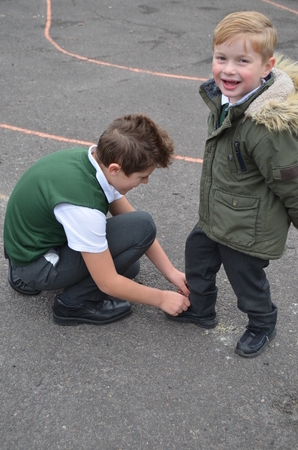 Oxford Reading Tree is our core scheme but is supplemented by a range of other schemes to ensure variety. Your child’s class teacher will determine when your child is able to access the different levels. Accuracy – children can ‘decode’ words they are reading without interrupting the flow. This is why we use phonics to teach children to read. Understanding – children who can draw meaning from the content of what they read. Fluency – children who can read at a comfortable speed with appropriate expression and punctuation. 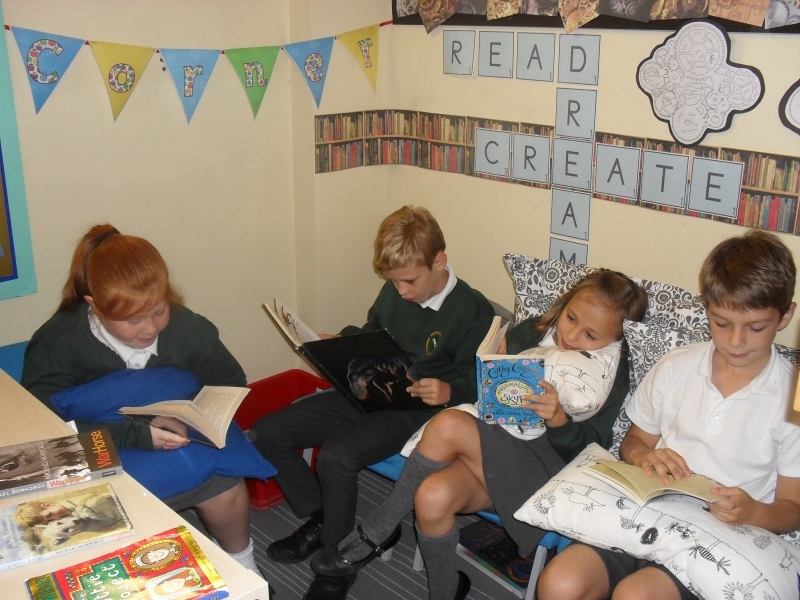 Once they are on their way to reading, children are taught individually, in small groups (supported reading and guided reading) and as a class to develop their reading further. If possible find a quiet place away from other interruptions. Spend a few minutes discussing the blurb and front cover of the book – what do you think this book is about? Help and support your child to decode an unknown word (sound it out) rather than telling them the word straight away. Give them time to do this. If your child is still struggling then take over the reading yourself but let the class teacher know. Ask your child questions to check their understanding of the text. For example, why do you think that the character said that? Which words show you that the character was feeling angry? What do you think will happen next? What was the character thinking when this happened? Discuss whether you both liked the book and why. Remain positive and encouraging, giving lots of praise. Feel free to read other books with your child as well. Joining the local library will allow you access to a wide range of books for free. Reading to and with your child is an enjoyable and positive experience. Talking about the things you read such as books, newspapers, recipes, instructions and shopping lists demonstrates that reading is a meaningful, useful activity. Ensure that your child knows you value reading – let them see you reading too! 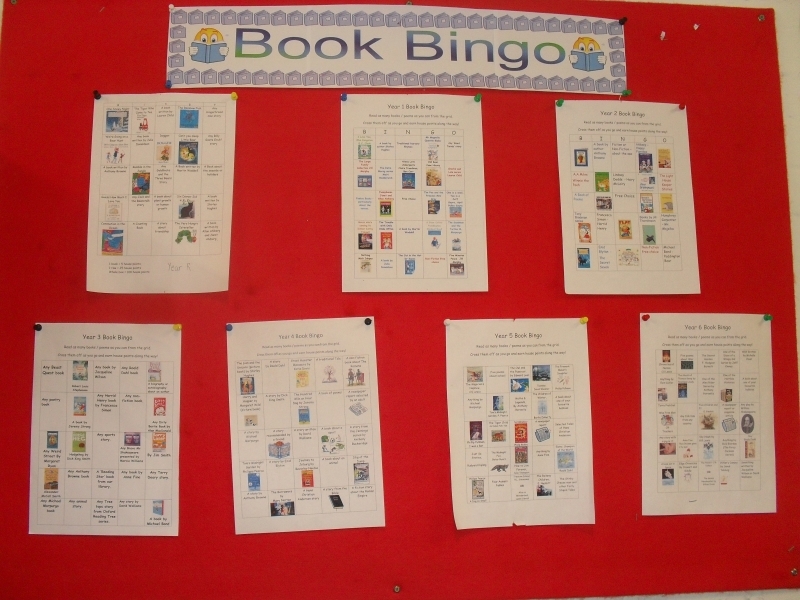 This was designed to ensure that all pupils at Mereworth read widely and Book Bingo sheets have been created for each year group. They provide suggestions for reading a range of genres and the children are rewarded for reading each book, earning 5 House Points. 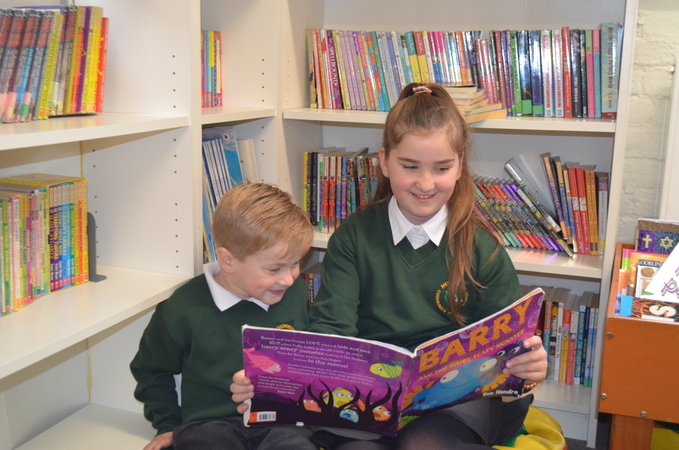 The books are all available to borrow from our fantastic and well resourced school library. Children need to expand and develop their understanding of a range of vocabulary in order to make sustained progress in their speaking and listening skills. 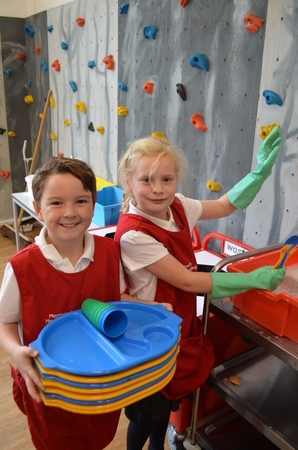 The understanding of technical vocabulary, as well as continually up levelling the range of vocabulary used across the curriculum, enables children to produce improved oral and written work across a range of subjects. We strongly believe that speaking and listening skills are the building blocks of English. In order to succeed as writers, children need to cultivate a love of words and language. They need to build a bank of stories, which they can draw on for ideas and language patterns, and develop oral story telling skills that help them internalise the language they need. Therefore, developing talk in the classroom is a priority. I CAN Talk Boost: EYFS and KS1 – Talk Boost KS1 is a targeted and evidence-based intervention programme, which supports children with delayed language in EYFS and Key Stage One to make progress with their language and communication skills. 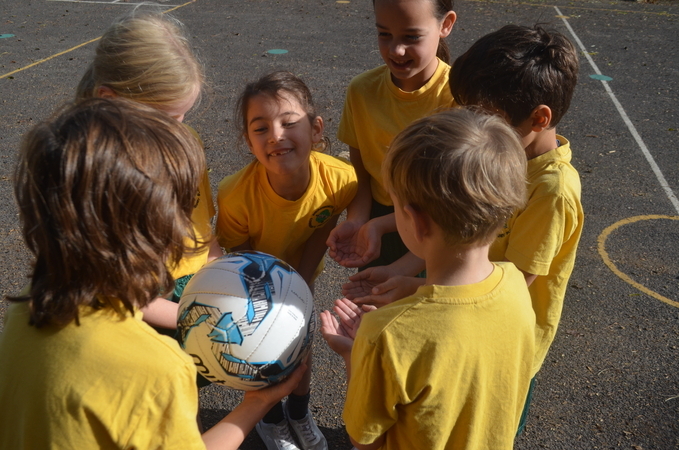 The programme is delivered by classroom teachers and assistants and provides a structured programme that accelerates children’s progress in language and communication by an average of 18 months after a ten week intervention. At Mereworth Community Primary School we use a systematic phonics programme called Letters and Sounds. Letters and Sounds is a phonics resource published by the Department for Education and Skills. It aims to build children’s speaking and listening skills as well as to prepare children for learning to read by developing their phonic knowledge and skills. It sets out a detailed and systematic programme for teaching phonic skills for children starting by the age of five, with the aim of them becoming fluent readers by age seven. Letters and Sounds is divided into six phases, with each phase building on the skills and knowledge of previous learning. There are no big leaps in learning. Children have time to practise and rapidly expand their ability to read and spell words. They are also taught to read and spell ‘tricky words’, which are words with spellings that are unusual. Phase One (Nursery/Reception) Activities are divided into seven aspects, including environmental sounds, instrumental sounds, body sounds, rhythm and rhyme, alliteration, voice sounds and finally oral blending and segmenting. Phase Two (Reception) up to 6 weeks Learning 19 letters of the alphabet and one sound for each. Blending sounds together to make words. Segmenting words into their separate sounds. Beginning to read simple captions. Phase Three (Reception) up to 12 weeks The remaining 7 letters of the alphabet, one sound for each. Graphemes such as ch, oo, th representing the remaining phonemes not covered by single letters. Reading captions, sentences and questions. On completion of this phase, children will have learnt the “simple code”, i.e. one grapheme for each phoneme in the English language. Phase Four (Reception) 4 to 6 weeks No new grapheme-phoneme correspondences are taught in this phase. Children learn to blend and segment longer words with adjacent consonants, e.g. swim, clap, jump. Phase Five (Throughout Year 1) Now we move on to the “complex code”. Children learn more graphemes for the phonemes which they already know, plus different ways of pronouncing the graphemes they already know. This approach has been shown to provide a quick and efficient way for most young children to learn to read words on the page, fluently and accurately. We want children to develop this skill so that it becomes automatic. This also greatly helps them with their spelling. Not all children learn at the same rate and occasionally we find that additional support is needed to boost phonic skills. Although Letters and Sounds is the main programme used at Mereworth Community Primary School, we also have staff trained to use other programmes when needed, such as Read Write Inc and Toe by Toe. In KS1 the ‘Topical Resources’ Scheme for Spelling provides a diagnostic assessment and carefully organised lists of spellings to be learned by pupils each week, ensuring that all phonic strands and high frequency spellings are learned in a systematic way, related to ‘Letters and Sounds: Principles and Practice of High Quality Phonics Six-Phase Teaching Programme’. 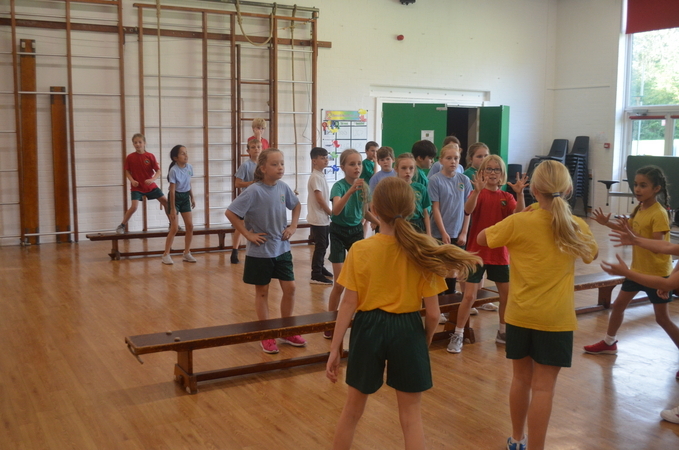 Suggestions are made for activities to enhance and embed the learning. There are supplementary lists for children who do not make enough progress and require reinforcement. Children are normally able to read more words than they can spell correctly. Therefore, many children will be working at a phase lower in spelling than in reading. To ensure that the children are learning spellings at the correct Phase they are given a diagnostic test at the beginning of each term to assess their individual needs. The “No Nonsense Spelling” scheme is used in KS2 to build on high-quality phonics teaching by supporting children in understanding morphology, spelling strategies, the orthographic nature of words, patterns, word origins, common exception words and personal spellings. Teachers plan to include the direct teaching of spelling patterns and rules as part of the balanced English curriculum and handwriting sessions give pupils opportunities to practice writing key words. In Key Stage 2, teachers check that the children are using correct spellings in their own writing. At this stage it is appropriate for teachers to point out when certain words are spelt incorrectly, but more importantly, that children recognise for themselves when they have made an error and know a range of strategies for correcting inaccuracies. By this stage children will have a range of spelling strategies that they will have been taught, to draw on. Children will use the strategy which best suits their learning style and works best for them. Writing develops pupils’ skills in two key areas – transcription (spelling and handwriting) and composition (articulating ideas and organising them into speech and writing). In Reception pupils are taught how to form lower case and capital letters correctly, so that in Year 1 they can begin to learn the pre-cursive strokes required for cursive handwriting. When pupils are ready, they will learn to write in a continuous cursive style. At Mereworth we understand the link between good talking and skilful writing. We also know that children will be motivated to write if the purpose of writing is clear. Writing is, wherever possible, linked to the class Power of Reading book, giving the children a secure context and purpose for their writing. Pupils are taught key skills to help them plan, draft and edit their work, learning to proof-read and improve their own writing, as well as having opportunities to discuss their writing with peers. 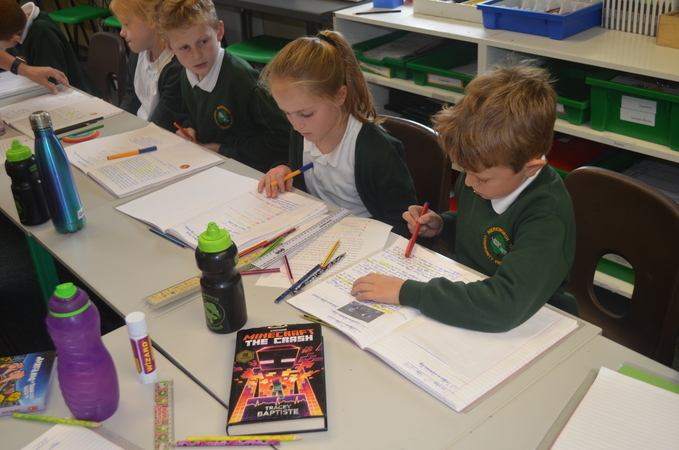 Pupils’ stamina for writing is developed through extended writing tasks which are linked to other areas of the curriculum, whilst building upon the writing skills taught during English lessons. Grammar and punctuation are taught explicitly through focused activities within the context of reading and writing. Once familiar with a grammatical concept, pupils are encouraged to explore and apply concepts to their own writing and speech.